1. Heat 3 tsp of butter in a pan. 2. Saute the sliced apples, brown sugar and cinnamon till tender. 4. Combine the eggs and cream and whisk till fluffy. 5. Melt the remaining butter in a pan. 6. Pour the egg mixture and cook. 7. Turn them over and add sour cream to the center. 8. Spoon the apple-cinnamon mixture and cook till done. 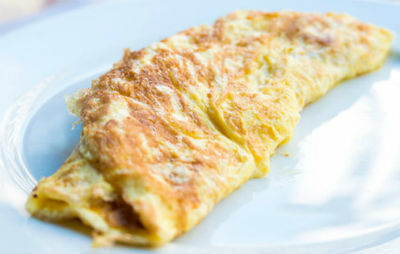 Feel free to comment or share your thoughts on this Cinnamon Apple Omelet Recipe from Awesome Cuisine.